While Wiki-Leaks founder Julian Assange is reportedly still holed up in the Ecuadorian embassy in London, there are several 'wiki-leak' movies already in the works. 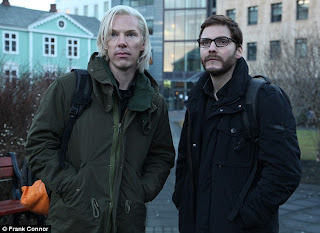 The first to actually go into production, The Fifth Estate or The Man Who Sold the World stars Benedict Cumberbatch as Julian Assange. 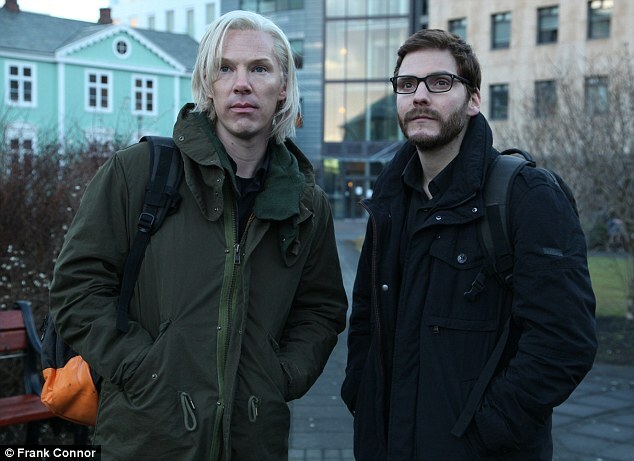 In the first picture released from the set we see a blonde Cumberbatch as Assange with Danile Bruhl as Daniel Domsheit-Berg. 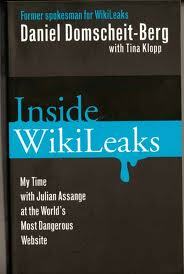 Domsheit-Berg penned the expose, My Time with Julian Assange at the World's Most Dangerous Website one of two books which informed the script. I love Cumberbatch's work - he is extraordinary as the quirky modern-day Sherlock, while his portrayal as Peter Guillam, the younger agent Smiley enlists to help him catch the mole in Tinker Tailor Soldier Spy, had me sweating nervously. 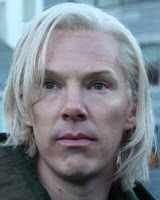 Hobbit fans know him as the Necromancer while Star Trek devotees have his turn as a bad guy in the next Star Trek movie to look forward to. Looking at a side by side comparison, it's clear that on the purely physical plane the casting is spot on. 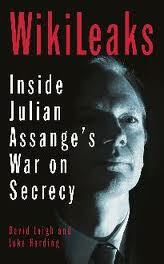 The movie is also based on the book by David Leigh, the British investigative journalist. If you think a film on Assange and Wiki-Leaks is premature, read the statement from Bill Condon, the director, via Dreamworks, the major studio behind the film. "It may be decades before we understand the full impact of WikiLeaks and how it's revolutionized the spread of information," Condon says in a statement released by DreamWorks. "So this film won't claim any long view authority on its subject, or attempt any final judgment. 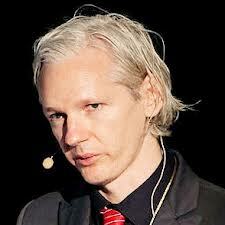 We want to explore the complexities and challenges of transparency in the information age and, we hope, enliven and enrich the conversations WikiLeaks has already provoked." 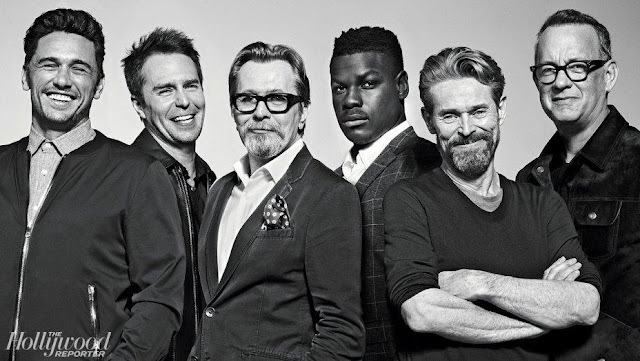 Laura Linney, Anthony Mackie, David Thewlis and Peter Capaldi are rumored to be in the cast but aren't listed on the film's imdb page where the movie is titled The Man Who Sold the World. 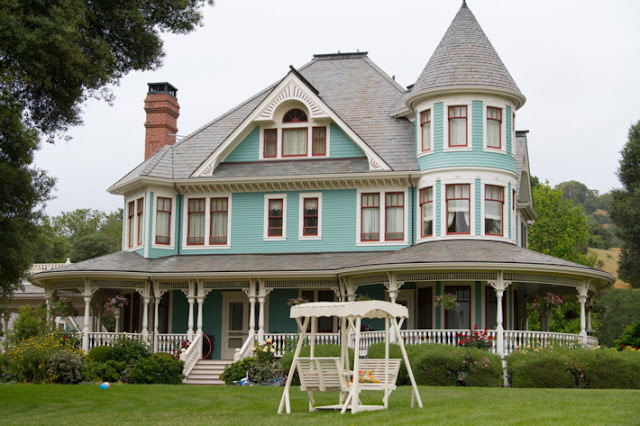 The film is set for release on November 15th in the states. Hm, I'm not sure that's a movie I'd be interested in.